YouTube recently announced 360 livestreaming, and hosted the first livestreamed music performance on YouTube last night. You, too, can do a 360 livestream. Here’s how. 3. Broadcast software (in this case YouTube). To do a livestream, you need to set up encoding software. For 360-degree cameras, the software needs to be capable of stitching the output from the camera to an equirectangular format (unless your camera already has a stitched output). 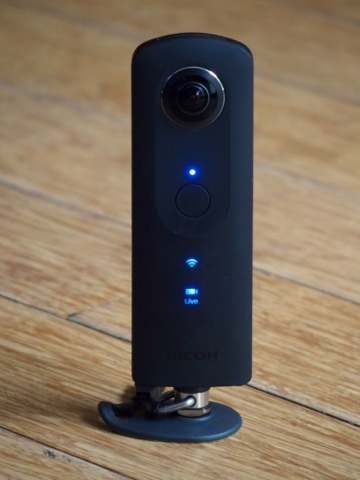 In the case of the Ricoh Theta S, the software for this is Ricoh’s UVC Blender. Here’s Ricoh’s guide. Here’s an unofficial guide that is also helpful. If installed correctly, you should be able to select “UVC Blender” as one of the webcams on your computer. You need to switch the camera to livestream mode. On the Ricoh Theta S, you should turn off the camera, then hold down the video/photo mode button. While holding down the mode button, hold down the power switch. Keep both buttons held down until the camera turns on. When it does, you should see a “Live” indicator below the mode display, as in the photo above. As an option, you may want to disable your camera’s sleep mode. – On Youtube.com, click on your user icon on the top right. Then click on the Creator Studio button below your avatar. 2. 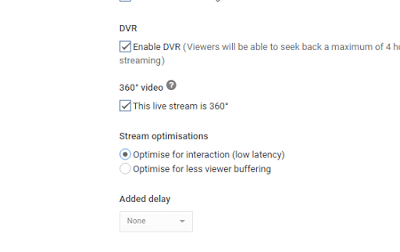 In Creator Studio, go to the left column and click on LiveStreaming. Choose Events, and click on Create New Event. – Title, description, tags, privacy. 5. Click on “Go Live Now” when you’re ready. That’s it. To let people view the stream, just copy the URL or use the embed code on your page. Huge Discount on Panono Bundle!